KETT Airbrush Makeup Classes are distinguished as the most comprehensive in the industry. This one-day airbrush makeup class will build upon your basic makeup skills and focus on the fundamentals of airbrushing. You will work first-hand with professional airbrush equipment and experience a new level of creativity with an emphasis on technique, artistic style and control. From choosing the correct foundation shade and perfecting the complexion to creating three-dimensional features for eyes and cheeks, this class will streamline your makeup skills to a new professional level. KETT Airbrush Makeup Classes are distinguished as the most comprehensive in the industry. This advanced, one-day airbrush class will build upon makeup skills taught in the KETT Airbrush Level 1 Class. The focus is on the products and techniques needed to create a waterproof, smudge-proof beauty makeup and tattoo coverage application. From prepping the canvas for waterproof beauty to seamlessly covering tan lines and tattoos, this class will teach you how to create a long-lasting, non-transferable makeup for the most durable and extreme makeup requests. The fine arts mastered. This airbrush makeup class series builds upon the fundamentals of advanced makeup artistry and includes both, one-day, KETT airbrush makeup classes: AIRBRUSH BASICS - Level 1 and ADVANCED AIRBRUSH - LEVEL 2. The airbrush makeup class series also includes the option of choosing between a series alone or add on the Pro Airbrush Makeup Kit at a special value. 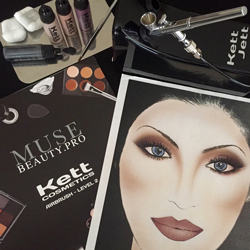 The KETT Airbrush Makeup Class Series are currently available in San Francisco, California and Chicago, Illinois.